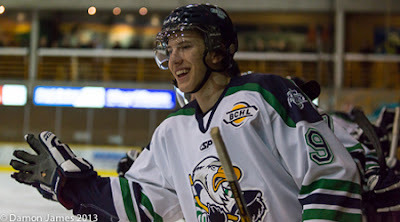 Surrey, BC - The Surrey Eagles Hockey Club is pleased to announce that forward Adam Tambellini has been selected in the third round of today's NHL Entry Draft in Newark, New Jersey by the New York Rangers with the 65th overall pick. "It's very exciting as an organization when you have a player drafted," said Eagles President, General Manager and Head Coach Peter Schaefer. "Adam had a great year personally and a great year for us as a team. We're all incredibly excited for him to be going to the Big Apple. To play in New York City at Madison Square Garden will be really special for him, and I'm sure he's going to have a great career with the Rangers." Tambellini joined the Eagles at the BCHL trade deadline this past January and was a key part of Surrey's run to the Fred Page Cup, Western Canada Cup and RBC Cup Semi-Final. In his 16 regular season games in Surrey, Tambellini tallied an impressive 14 goals and 12 assists. He continued his strong play throughout Surrey's post-season run, putting up 28 points in 27 games. To cap off his playoff performance, Tambellini was named the Top Forward at the RBC Cup in Summerside, PEI last month. The 18-year-old is set to attend the University of North Dakota in the fall. The Eagles would like to congratulate Tambellini on this impressive accomplishment.